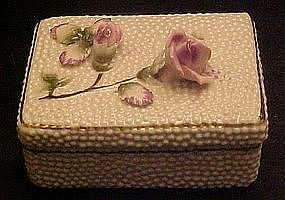 Pretty old fashioned dresser box made by Fred Roberts of San Francisco. (Original foil sticker). Measures 3" x 4 1/4" and is 2" with lid on. Made of glazed porcelain with applied roses and leaves. It has a bumpy cottage cheese texture and gold trim. It is in excellent condition with no damages.